LID TYPE-The 112 has hinged glass lids, the 55 has one hinged glass lid and a plastic window peice, the 75 has a table glass & double-pane house window. 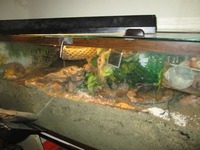 DO YOU HAVE AN ISOLATION TANK FOR SICK/INJURED/MOLTING CRABS-I have a 15 set up as ISO but also an empty 10 & 29 as well. HOW MANY EXTRA SHELLS AND WHAT SIZES DO YOU HAVE-Literally thousands since I have inventory for my store as backup. They vary from VERY tiny to a 3" opening. ANYTHING ELSE YOU WOULD LIKE US TO KNOW-I can only meet in the Columbus area. Being able to help with gas will be determined by how much money I have at the time. I house my species separately (straws in the 75, Es in the 55).